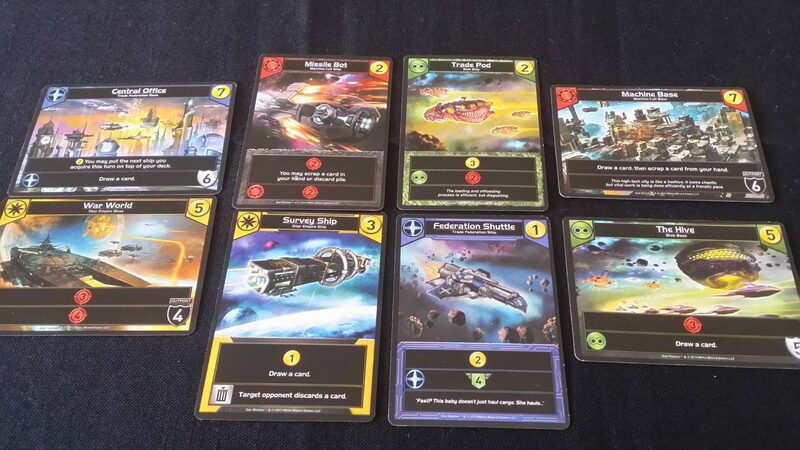 Star Realms is fast, pacy and with a lot of genuine charm. We gave it a healthy 3.5 stars in our review. Do you want to play it? Can you play it? It’s time for an away mission to find out. You can wear that red shirt there. Don’t mind the stains, the last crew-member didn’t have an opportunity to have it cleaned. There is some minor overlap in terms of the colour palette for the borders of the cards, but it’s not actually a problem because that border is compensated by the faction symbol in the top left corner. True, colour blindness will impact on the art quality to a significant extent, but there’s not much that can be done to prevent that in a game where the visual aesthetic is so important. Cutter was my high-school nickname, coincidentally. We strongly recommend Star Realms in this category – well done, White Wizard Games. All I can see here is my oncoming doom. Flavour text in particular is printed in a tiny font and in italics, which is an unnecessary ornamentation that obscures readability. Otherwise, the cards are reasonably accessible to those with minor to moderate visual impairments. Assuming you have access to a magnifier or some other equivalent assistive tool, the cards are consistent enough and with large enough symbols to lend themselves to relatively easy examination. It’s a two-player card game, with some degree of shared state. There’s no necessary contiguity of the card area and so it can be arranged in whatever way is comfortable. 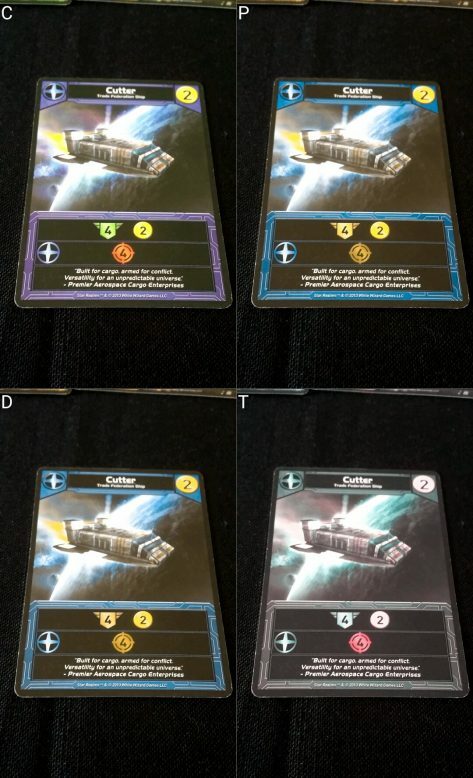 There are only ever six cards that need to be considered per turn in the marketplace, and your hand will usually only result in five cards in front of you unless ship abilities allow you to draw more. The difficulty in this is that the card abilities are heavily synergistic and may require a lot of scanning between ships. You have to work out what faction bonuses apply, what scrap bonuses are sensible to adopt, and how much attack and trade power you have to spend. The need to reference and cross-reference cards is a considerable barrier her. If you trust your opponent you can ask for the key summaries, such as ‘how many federation ships do I have out’ or ‘how much trade does all of this total?’. Otherwise there are sometimes so many abilities that combine in so many ways that you’d need to spend so much time going over each card with a magnifier that you’d inevitably lose track of where you started before you got to the end. Some assistance is going to be needed to handle this. However, on the positive side you don’t actually get a choice as to what cards come into your hand – no matter how big your deck, you only need to deal with the cards in front of you. Sometimes you’ll need to go into your discard deck for scrapping purposes, but in most of those cases you’ll be looking for specific cards rather than considering the interplay between factions. For those with more severe impairments, where there is no ability to visually differentiate the cards, the game would not at all be appropriate. None of the cards have any tactile indicators, and the authority cards used for tracking health are double-sided and must be flipped and manipulated in a way that’s problematic even for sighted players. As in the review, we strongly recommend you make use of *any* other form of tracking authority. We provide a tentative recommendation here for those with mild to moderate visual impairments, but it’ll be necessary to exercise some judgement as to its suitability based on the discussion above. Nope, not even a little bit. There’s just far too much in the way of card synergy for the game to really be anything more than a spectator sport if you can’t meaningfully understand the interplay of cards yourself. You could certainly deal yourself five cards and let someone explain the consequences, but that is in no way meaningfully the game everyone else would be playing. While the reading level required is not especially high for anything other than the flavour text, there is a certain degree of technical jargon that must be mastered (scrap versus discard, outpost versus base, and so on). There is complexity of ascertaining game state that puts understanding and executing card synergy out of reach of any but the most minor of cognitive impairments. Game flow is mutable, although always progresses in turns from one player to the other. What that turn involves though will depend on what the previous player has done and what cards the current player draws. That may result in more cards making their way into the active hand, the need to handle scrap, or the choice between multiple possible ship abilities. Damage is inflicted reasonably consistently, but the presence of outposts and the tactical choice between damaging a base and the player must be weighed up. Choosing which cards to buy from the marketplace is the key strategic choice you make, and if you do it poorly you’ll have no real chance of winning. Stacking your deck with redundant opportunities for synergy is the only real way to set up consistent chains, and that requires a mental inventory of card composition and weighing up the cost of cards versus the potential reward. That’s cognitively expensive both in terms of fluid intelligence and in simple memory management. Much of the game impact of cards is encoded into symbols, and while these aren’t complex they do add a certain cognitive load to understanding the impact of what’s going to happen based on the ideogrammatic conventions. This is a memory burden on top of the existing memory burdens the game imposes. There’s also a fair degree of conditionality in rules – some ally abilities, for example, allow you to ‘acquire’ a card for no cost – that’s fine. But instead of acquiring them to the discard pile, they are placed on top of the main deck. Some ships allow you to destroy bases without spending attack points. Some cards permit draws based on the number of a certain faction already in play, and so on. All of this places a significant burden on fluid intelligence. We strongly recommend you avoid Star Realms if cognitive accessibility is at all a consideration. The largest problem in terms of emotiveness is the role that luck plays in the game. It’s not the only factor, and it could certainly be argued that it’s not even the most significant factor, but it is a major factor. Card curation can only go so far in mitigating the impact luck has on play, which tends to lead to a game that is very uneven in any individual match. Over the long term, skilled players will tend to win more often than unskilled players – but much as with any individual hand of poker, there’s only so far skill can take you. On the plus side, if you are a poor player you’ll win quite a lot just through accidental card synergy at the right times. On the negative side, if you’re a good player you’ll also lose quite a lot through that same synergy. If we think of frustration in part as a side-effect of not being able to consistently influence the outcome of a situation that would seem manageable, then we can see why Star Realms may not shine in this area. The nature of randomness too is that it is often ‘clumpy’, and it’s possible that you will end up with several unfair losses in a row. Anyone can become infuriated by that, but it’s obviously an especially sensitive issue when dealing with emotional or behavioural disorders. In a multiplayer game, there is a high potential for player elimination. Depending on which variant you use there is also a possibility of enabling a degree of bullying through ganging up – players that are perceived to be significantly in the lead are likely to be targets in a free-for-all multiplayer match. The end result can be anger and upset as you are knocked out early and have to wait watching everyone else have fun until you get dealt back in. On the plus side, individual matches are relatively quick and it shouldn’t be too long before you can rejoin the game. Score disparities in Star Realms can be considerable. While it’s common to have squeakers where the winner is decided by a point or two of authority, it’s also common to have games where one player wins with thirty or forty health left. Given the healing mechanics, and how federation ally abilities often include healing as a bonus, a lucky chain can even propel a player past their starting ‘health’. They can actually end the game with more authority than they had the start. These kind of score disparities can always be a trigger to anger, but there is a compounding issue in Star Realms. The nature of synergy chains is such that the right combination of ships entering play at the right time may turn a player from being the imminent winner to being utterly crushed in the swing of a single turn. That leads to exciting, tense matches but it also leads to a not unreasonable sense of being robbed. If you are on forty authority, and your opponent is on six, suddenly finding out you lose feels like you were playing with a marked deck. I’ve been in this situation – it absolutely happens, although that extent of a differential is reasonably rare. Losing from a twenty authority advantage though isn’t uncommon, and knowing there was nothing you could have done to prevent it doesn’t help. However, all of this said we offer a tentative recommendation for Star Realms in this category. If you can accept a decoupling of skill and outcome you can find an agreeable sense of comedy in the humiliating losses knowing that they don’t necessarily reflect on your ability as a player. The cards that you play with are of standard poker size, and of a decent stock. They shuffle easily and feel solid in the hand, although the glossy coating may perhaps be an issue with regards to keeping a firm hold. However, there is no need for any significant in-hand management – you deal out five cards and you play them in front of you. Your deck is hidden from your opponent, but it’s also hidden from you – it’s just left face down on the table. When your turn is over, you discard your hand into a separate pile. You never have to actually hold the cards for very long – it’s not like a game of poker. That’s great. As with the issue of visual impairment, the fact it’s a card-game lends itself well to adopting a layout that is comfortable for everyone involved. As the standard game is two players it means that you can sit side-by-side to minimise distance between gameplay elements. The marketplace can be placed within convenient reach of those with some degree of arm or hand movement. For larger player groups it’s more challenging to arrange this, but still not outside the bounds of possibility. However, there’s a lot of shuffling in Star Realms because once you run out of cards in your deck you shuffle your discard pile and it becomes your new deck. Since you shuffle small numbers of cards (at least to begin with) most standard shuffling techniques will be uncomfortable to perform. If you are serious about ensuring randomness you will likely be left doing a wash shuffle for comfort – that tends to involve a fair amount of free space and freedom of motion. As you accumulate cards it’ll be easier to move to more standard shuffles, but that’s not going to be much of a selling point if shuffling is inconvenient, painful or simply not possible to do. 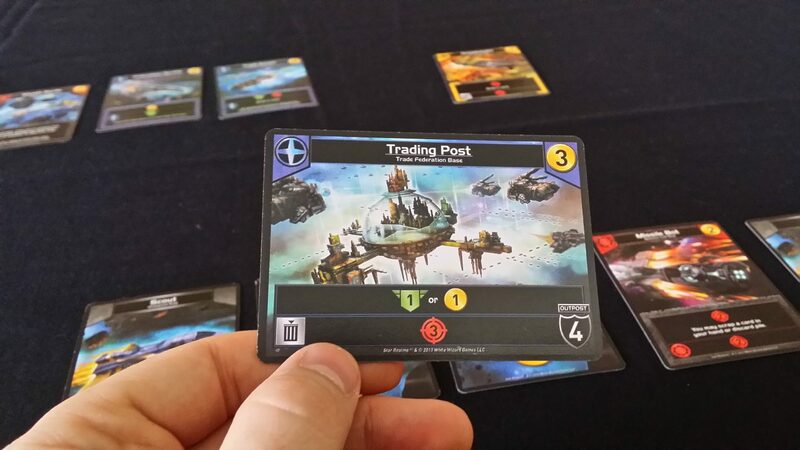 We’re going to recommend Star Realms here, with the usual proviso that you should consider whether or not physical agency is an important consideration. That will be critical as you decide for yourself on the game’s suitability. We don’t believe it can be played easily without the support of another person, but given the nature of the game that person can easily be your opponent. In some games, that would risk your opponent getting a glimpse of secret cards and state information. It’s not an issue here. There is a reading level requirement on the cards, which isn’t seriously high for anything but the flavour text. There’s no other need for communication, bluffing, negotiation, or pleading for mercy in the face of an overwhelming influx of attack power. We recommend Star Realms in this category. 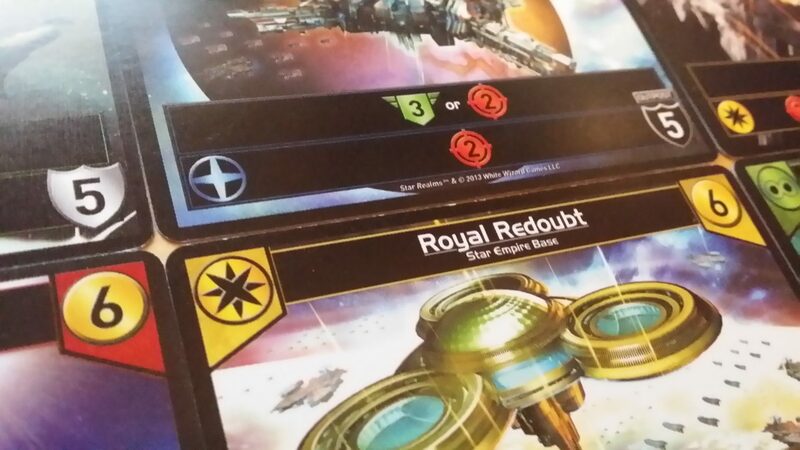 Star Realms gets a clean bill of health here – there is no overtly gendered artwork, or the assumption of masculinity in the slim instruction manuals. It supports only two players with a single deck, but is a reasonably cheap £19 RRP and is often discounted down to the vicinity of £10. We’d be a little uneasy to recommend it at the higher end of that price point, given how little you get for the money, how flimsy the box is, and how few players it supports. You definitely get a lot of game for a tenner, and doubling up becomes entirely feasible at that point. You can keep buying base decks as often as you like to support larger player counts, and it’s the kind of game that lends itself well to obsessive re-playability. Like many deck-builders, there is a wealth of nuanced expertise that can be developed through repeated play, and a vibrant community with which to discuss your findings. There are no dice rolls or hidden hands in the game, eliminating some of the common issues of physical and cognitive intersectionality. There are no inherent time constraints (other than ones players choose to enforce themselves), and while your deck will become large and unwieldy before too long you never have to actually physically manage it in your hand. These are all important benefits. The downtime between turns can be an issue due to the load it places on both attention and patience. While early turns play quickly, for a lot of the later turns you’re mostly watching your opponent tot up totals and ally abilities and scrapping bonuses. There’s nothing you can do in that circumstance except sit and watch. For very large hands there may be minutes of thoughtful mental computation before a number is eventually revealed. An attentive player may try to work out the implications of a hand along with the other player, but I’d be loathe to consider that option an antidote to the downtime. Especially if in doing so it leads to the frustration that comes with seeing an early prediction of forty attack power worth of hot laser slicing into your armada. Indeed, it can actually exacerbate the issue – if you know all your opponent needs is six attack power to defeat you, watching them count up into the twenties and thirties comes across as little more than rubbing it in. The most significant issue from an intersectional perspective is that the game has zero support for dropping in and out – it’s a turn based dueling game, and if you’re not there to play there is no game. The good news is that the game is over and done with in about twenty minutes, although you’ll need to make allowances for compensatory accessibility strategies in terms of extended playtime. The time-frame though is short enough that it won’t significantly exacerbate issues of physical, cognitive or emotional distress. We do encounter our usual issue here regarding physical impairments when they are combined with communication impairments – our recommendation for the game in either category is conditional on being able to physically manipulate cards, or to communicate the instructions necessary for someone to do it on your behalf. If neither of those are possible, the game is not playable. 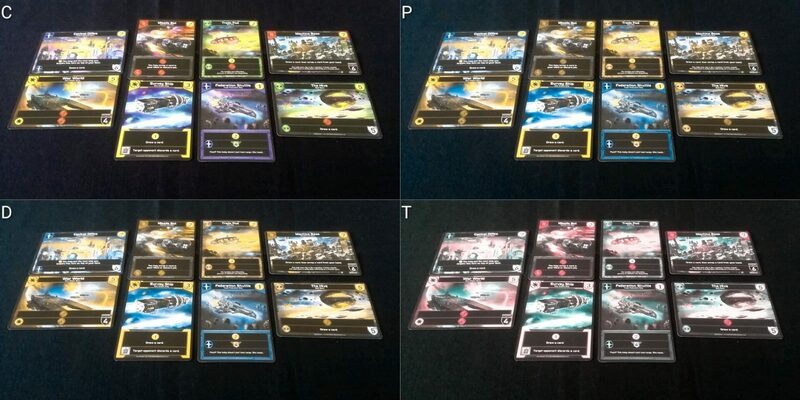 Star Realms is going to cause problems for those with cognitive impairments of any significant degree, and we’d be wary about recommending it too strongly to those with visual impairments, or if anger and frustration is likely to be a key consideration. Otherwise, if you fancy it you’ll likely be able to find a strategy that allows you to meaningfully play and enjoy the experience. We gave it 3.5 stars in our review, and it’s cheap enough that you can’t go very wrong in giving it a go if you think you can actually play.